Chapter 10: Hanafi practice and sultanic ordinances: Which normative rules did finally prevail? 1In all the adjudicative practices encountered thus far, whether in the form of individual chapters, sections, or epistles in the fiqh manuals, or fatwās, or the adjudication of the sharī‘a courts, a process had begun to unravel. Opinions were always selected from a handful of authoritative sources from the madhhab, based upon their need for a specific purpose. Those opinions were typically decontextualized from their original sources, as there was no effort deployed to understand an opinion in the context of its text of origin. What in fact provided meaning to a set of opinions was, on the one hand, their relations to one another, and the assessment that they are able to provide on the specific matter they were chosen for, on the other. In other words, the aim was not to understand an author, his œuvre, or even a specific text of his, as much as to use one or more of his opinions in conjunction with other “similar” opinions—all with the sole purpose for adjudicating on a contemporary issue. Opinions thus behaved like codes that scholars simply “found” suitable for a particular matter at hand; and besides their immediate usefulness, it was their association with totemic figures of the past that ensured their respectability. 2What really mattered then was less the body of textual evidence itself, and more how those texts were grouped together and interpreted, and how their meaning, through analogical reasoning, was associated with the case in question (or a ḥāditha, in the jargon of the fiqh). In fact, the diverse body of opinions, having been selected from a variety of texts, all were from within the Ḥanafī juristic typology, hence from different authors, localities, and historical periods, were all quoted ad hoc, and then by means of analogy brought together in relation to one another and applied to a contemporary case. 3For each period (or generation), scholars, whether jurists, judges, or muftīs, worked out methods that redefined the practice of their madhhab in terms of opinion-finding, interpretation, rules of analogy, and rules of custom recognition. In short, they redefined all the idioms of their school so as to adapt them to newly emerging societal conditions. In this process, the major notions of both civil and criminal law, such as contract, property, rent, taxation, and crime, might be amended, with clauses and fatwās added, so as to adapt them to contemporary needs. 4Overall, the nature of change in Ḥanafism is very much incremental rather than structural or evolutionary. In fact, the various practices that emerge for each period, were in principle contingent on so many variables that it would be hard to predict outcomes to specific cases. Yet, the Ottoman judiciary, by any standard, was not such an open system so as to generate drastic changes. Besides the interpretive strategies outlined above, the “general rules (al-qawā‘id al-kulliya)” of late Ḥanafism, as enunciated first by Ibn Nujaym and later reenacted by the Majalla, acted as metaphorical elements of legal doctrine whose effect could be perceived at several interrelated levels. Moreover, judges, despite their discretionary powers, were subject to enormous constraints when it came to ruling on hard cases, while the bulk of sharī‘a cases routinized to such a point that nothing unpredictable would come out of them. Finally, the judiciary apparatus was the exact opposite of a well behaved bureaucratic institution since anything from teaching, transmission of knowledge, and adjudication were all conducted on a person-to-person basis, all of which contributed to keeping such institutions within the realm of the predictable. 5It would have been difficult for that system and the type of practices that it generated to assume all the judiciary functions of the Ottoman Empire. For one thing, it was much too rooted in an old idiomatic language that was not always effective despite some efforts of adaptation. For another, new laws and regulations were needed for which the fiqh had no particular answer. That is why sultanic legislation was a de facto system that was kept parallel to the sharī‘a, and which behaved with its own grammars, methods, and assumptions. 6Our concern in this chapter is centered on texts that could be grouped together under the label of “sultanic legislation”—firmans, decrees, dustūrs, laws and regulations, etc., which altogether represent a different method of drafting texts and interpreting them. Freed from the Ḥanafī tradition, the sultanic corpus of texts, thanks to the authority of the sultan, moved more freely and with different idioms than sharī‘a practice. 8Ijtihād,therefore, pushed the system away from stagnation, but that in itself was not enough since it kept the opinion-making process locked into layers of past opinions, however unsuitable those might have been. In fact, an opinion that was the outcome of ijtihād had to be constructed on the basis of analogy with older opinions and in conformity with well established principles. To break this hermeneutical circle of opinion-making, jurists had to accept the notion that at least some of the customary practices ought to be recognized either through specific rules of recognition, or else on an ad hoc basis, that is, without necessarily following the fundamental rules of analogy, interpretive reasoning, or even consensus among the opinions of the madhhab. Ḥanafism functioned overall autonomously on its own without much intervention from non-religious officials. 10In Beirut, new firmans were inserted between cases as if they were cases all by themselves, in an apparent effort to render sultanic legislation visible to the courts. But considering the limited jurisdiction of the courts, what was the aim of such a visibility? I am particularly interested in the visibility that was intended for a set of texts, with very little relation to one another, and juxtaposed in the court registers, as soon as they were received from Istanbul, side-by-side to other court cases, even though they seem to have had very little impact, if at all, on the procedures of the courts themselves. The original texts were usually in Ottoman Turkish, followed by an Arabic translation, but at times, the text was either in Turkish or Arabic without the presence of the other mirror-text. Yet, despite this textual juxtaposition between sultanic regulations and sharī‘a cases—to the point that sultanic decrees often did not even start at the beginning of a new page—they nevertheless shared but very little in their respective grammars. In fact, sultanic decrees were drafted in a perlocutionary style: orders, threats, demands, and the like. They neither shared the multi-level structure of the sharī‘a cases and the shifts between a first- and third-person speaker that were common to them, nor the Ḥanafī adjudicative procedures for that matter. Indeed, sharī‘a courts had to construct for each case a text that would handle the multi-level personalities involved in the litigation: plaintiff and defendant, their representatives and witnesses, the muftī’s fatwā, not to forget the judge himself who, even though he was the sole creator of a case’s textuality, managed to fit himself into a language of authority by distancing himself in the third person. 11Sultanic texts were not in need of such elaborate shifts and twists as they were drafted on the assumption that they be applied as soon as possible. Addressed to an anonymous body of rulers, judges, officials, and ra‘iyya, the text of a sultanic decree seldom proceeds with the “I” form (or “we” for that matter), even though the speaker is supposed to be no one else but the sultan himself. It rather opts extensively for “our,” or the possessive form for “we”: our laws, our lands, our army, etc., so that used as a modifier before a noun, “our” gives the impression that all possessions and institutions are collective—possessed by some kind of collective spirit—and hence framing and applying the law enhances such a spirit. 3 Beirut sharī‘a courts, unnumbered register, p. 134, end of Rajab 1266 (May-June 1850). 12[C 10-1] In a sultanic firman on conscription addressed to the people of Beirut by the middle of 1850,3 the addressees are referred to either as “the people (al-jumhūr),” or as “you, who are addressed (antum ayyuhā al-mukhāṭab-ūn).” The second mode of addressing in particular has a perlocutionary force that is at the same time threatening and comforting in the order it attempts to impose: “So, you—the addressees—you should gather in one place with all those who should also be there, as stated in the aforementioned law.” Such statements were drafted either with an explicit message: “you should do so-and-so, otherwise you’ll be punished in such-and-such manner,” or else the threat was hidden and concealed early on in the statement: “you should do so-and-so, otherwise you know what kind of punishment will follow.” In most cases, punishments were not detailed and deliberately left vague and obscure: this is because misdemeanors against “public laws” were not usually brought to court, whether the sharī‘a courts or any of the newly established courts of the Tanẓīmāt. 13Surprisingly, the full one-page text of the sultanic firman was in Arabic with no accompanying Turkish text as was usually the case; and its subject matter was conscription. According to the document, all young men (futyān), ages twenty to twenty-five, could be subject to conscription: they were to be solely chosen by lot, and the title of the document made that explicit: “A copy of an exalted firman in the right of lot (ḥaqq al-qur‘a).” The “right of lot” was meant to be ambiguous: Was it referring to the state authorities’ right in choosing conscripts by lot? Or did the potential conscripts themselves enjoy the right to be chosen by lot, that is, no full and systematic conscription was required but only a partial one? In other words, it needs to be known whose right was it, the state or the conscripts? The tone of the document seems to suggest that it was the state’s right to draw lots on potential conscripts, and that the event ought to be fully publicized (the inclusion of a copy, ṣūra, between sharī‘a court cases was probably meant more as a device for publicizing an event rather than, say, a legal tool intended for judges) so as to take place only once a year in order to select forty-eight individuals (nafars) from Beirut itself. 5 Karpat, “Ottoman Demography,” 215. 15As to conscription, the Ottomans, having relied almost exclusively on their Janissary corps until its defeat in 1826, which as a system was highly selective, avoided a conscription based on randomly or systematically recruiting males from all the empire’s populations since the purpose was precisely to avoid a military integrated with locals. The 1850 firman, in a way similar to all nineteenth-century censuses, was therefore part of a new policy that began to target local populations in creating a newly reformed military. During the Egyptian occupation of Greater Syria (1831-1840), the peasants were the repeated targets of the military authorities for conscription purposes, and the pattern was one of general arrests in the fields, from which men were selected and driven far away from their homes to far away places.6 With the Ottomans gaining once more their control over Syria in 1840, the pattern already established by the Egyptians had to continue, but, at least in cities, selecting all those males had to follow a more imaginative process, hence the conscription firman. 16The shift therefore from kin-based households to the individual nafs represents a cognitive and practical transformation whose impact is visible in many official texts. Thus, even though since 1838 (date of completion of the first census) only the Muslim males of a certain age were targeted for conscription, the whole notion of “casting lots,” that is, the qur‘a, implied a shift from the household, kin, and community, on the one hand, to that of the individual on the other. But what the text of the firman, whose label reinforced the “right to choose by lot (ḥaqq al-qur‘a),” indicates is that all “modern” notions based on the individual subject were, by the middle of the nineteenth century, still poorly implemented so that the text keeps hovering between those individuals chosen at random, and those members of a religious “minority,” who, like the Christians, were not entitled to that random choice. In fact, choosing by lot implies randomness, arbitrary choice, and a formal equality among individuals—notions that were incongruous with and constituted a threat to the very existence of kin-based groups. Many of the official and non-official Ottoman texts, in particular during the period of reforms, manifest an ambivalence to bureaucratic and political notions based on “arbitrariness” of any kind. 17 Even though sharī‘a court texts would seem to their “reader” not addressed to anyone in particular, they were nevertheless not drafted with “all the people” as potential addressees. Thus, the difficulty in understanding the language of such texts stems from the fact that they were drafted for a few specific individuals, but to unlimited addressees whose social and official status could vary greatly: in other words, those were private documents in the first place, and not meant to be circulated around. They were also meant to memorialize an event (ḥāditha), as portrayed in Ḥanafī doctrine, in order to emphasize a faithful recording of facts. 18By contrast, firmans manifested an opposing tendency. First, they were not meant to keep track of an event but to inscribe the sultan’s signs, reproduce them in copies (ṣuwar), and disseminate his legislative will throughout his empire. Thus, a firman is more at ease in addressing a collectivity—even those who are not directly implicated. In the 1850 firman whose object was both to describe a procedure for choosing conscripts by lot and to legitimize such a step, the text first addresses a limited number of high-ranking officials, then suggests that those personalities share a common responsibility in disseminating the firman’s content to the population at large; and, in the final third of the document, the population of Beirut is at a direct challenge without any mediation. Such shifts are common to firmans, and the choice of addressees is closely related to the tone in each section: thus, when the tone is meant to be descriptive, it addresses the high-ranking officials specifically, but when a shift occurs between the descriptive, prescriptive, and the perlocutionary, the nature of the addressees change too. 19The text, referred to both as “our firman” and “our order (amru-nā),” first addresses a line of high-ranking personalities: the wālī of the province of Sidon (to which Beirut belonged), the supreme judge, and finally the majlis of Beirut. As to the text’s second “descriptive” part, it also addresses itself to those same personalities by ordering them to disseminate, as soon as possible, the contents of the firman. Once you receive this noble sultanic signature [al-tawqī‘ al-rafī‘ al-sulṭānī], you should inform [the people] [tuḥīṭū-na ‘ulum-an] that all measures [tartīb-āt] concerning our sultanic soldiers, whose situation has now stabilized [istaqarrat] thanks to the help of God, have also been reorganized [muntaẓama]. Each military unit [arduwi: contingent?] is assigned [tukhaṣṣaṣ] to a region of the provinces of our guarded kingdoms [dā’ira min diyāru mamāliku-nā]; and those who are recruited for military service remain for a five-year period only. Once this period has been completed, [the soldier/officer] will then be allowed to leave the service and receive a release notice [tadhkarat al-iṭlāq]. He will be able to go back to his home-place [waṭan-ahu] and city in order to ensure a living and work in plowing and agriculture, or any other craft or labor; he will [also] be tied [muqayyad] to the reserve army [al-‘askar al-radīf] which is a general force for the Muḥammadan confession [quwwa ‘umūmah li-l-milla al-Muḥammad-iyya].7 Those who are dismissed [yustakhraj-ūn: taken out] from a military camp after completing the five-year service, will be replaced with an identical number [of candidates] from people of the same locality [ahālī tilka al-diyār], which has been assigned to that military unit from which young men, ages twenty to twenty-five, would be recruited by a just and legal lot. 20The text limits itself thus far to a description of the process; it also explicates the reason for adopting a particular conscription method—in drawing lots. The idea of recruiting local conscripts by lot from the (Muslim) population was, at that time (since its implementation in 1838; 1840 for Bilād al-Shām), a new concept whose implementation proved to be difficult for two reasons: 1) the Ottoman (regular) army would be mainly constituted by conscripts from the local populations of the empire; that was a major departure from the old system of establishing special élite units, composed of sipāhis and Janissaries, whose cavalrymen and officers were for the most part recruited as slaves from very specific minorities, age-groups, and provinces; and 2) that would be followed by a process of randomization, also new for a kin-based society officially divided into millets: even though the lot drawing was to exclusively target the “Muḥammadan millet,” randomizing did not match the spirit of carefully structured alliances based on kin, family, region, religious status, all of which acted as a safeguard to hierarchical solidarity. 8 Timothy Mitchell, Colonising Egypt (Berkeley: University of California Press, 1991). 21The firman promises a “stabilization” of the armed forces in the sense of the subjection of all recruits to a newly designed niẓām diagram of order and power within the military. The new diagram of order was probably modeled after the Egyptian experiment, which in turn followed a French disciplinary model.8 It overall signifies a radical turn of events not only because the army would not be limited exclusively to special groups, but because of the disciplinary techniques that were required to bring together recruits from very different backgrounds. 22All such factors, combined with the fact that the promulgation of new laws was not the work of an elected body of legislators, but of the sultan and his entourage, all created a hidden essential tension within the text. Thus, the persons and institutions to whom the firman was addressed, all of whom were elected ex officio, were the ones who “received” the firman for dissemination. The combination of divine and religious representations, associated with political and economic privileges, gave those ex officio recipients the task to propagate the sultan’s signs as law. The reception of the text of the law by a narrowly defined élite provided it with its first test of legitimacy since that élite primarily functioned in transmitting, informing, and legitimizing. 23In order to make itself acceptable, the text had to minimize the impact that a yearly drawing by lot would have had on the population. Everyone, emphasizes the text, within the five-year age category was to be equally targeted, “whether rich or poor, distinguished or humble.” Religious differences were to be avoided, except on one occasion when the ambiguous category of the “reserve army” was mentioned—the “Muḥammadan millet.” No mention either of kin, family hierarchies, or neighborhood networks, even though those must have posed a great challenge for the entire conscription program. In short, the firman’s text avoids naming any potential resistance (as any regulatory text would do) and instead focuses on the new order of things. The new order dictates a random choice of conscripts, hence a couple of factors were crucial: randomness, the statistics of numbers, and the tabulation of all facts in specially devoted defters. Randomizing the process of selecting conscripts ipso facto implied creating a new way for counting the populations on the basis of individual subjects, so that even those who were not within the specified age category were also indirectly affected by randomization: they were not anymore, from the state’s point of view at least, embedded as individuals into khānes and households. A military officer was dispatched from each unit in every qaḍā’ of the regions [diyār] in which the unit is stationed in order to register the number of male individuals in a defter mufaṣṣal. ... Each military unit of our sultanic soldiers had previously dispatched to the Arab regions [al-diyār al-‘arabiyya] officials [ma’mūr-ūn] who filled defters detailing the total number of the male populace [‘adad nufūs al-ahālī al-dhukūr] in the regions included [within the boundaries] of each qaḍā’ on a separate basis. Concerning the number of counted individuals in Beirut, forty-eight nafars are going to be selected...by lot. [A military officer] will be accompanied by a ‘ālim in order to test those who claim [religious] knowledge [ṭalabat al-‘ilm],9 and by a doctor who will decide those who do not fit for military service. 24The descriptive tone, in this second part of the document, provides a concrete account on how to proceed with the lot drawing by linking the idea of a “modern” census, based on a one-to-one count of all male individuals, with a random selection of those same individuals: in other words, randomness had to be preceded by an exact count of the (male) populace. That was the novelty of the system. But even though the text is describing a newly designed project, it is still trapped in the intricacies of the ancien régime. Thus, the reference to the Arab regions is but another one of those old clichés that served its purpose too well in containing all ethnic and linguistic divisions within the empire, but its uncertainty during the reforms comes from the fact that the new policies were precisely meant to forgo such divisions, and which anyhow led to the exact opposite: nationalisms all over, and political movements seeking independence. Another remnant of the old regime is the religious requirement imposed on all conscripts—that they should be Muslims—even though, surprinsingly, that condition comes only once in the text, and indirectly, when the uncertain category of a “reserve army” is mentioned. But probably the most problematic notion in the document is its title: ḥaqq al-qur‘a. Since conscription was not systematically applied to all citizens, that is, could not be viewed as “universal” in its scope, a lot drawing looked unfair at best: every year, it paralyzed the lives of forty-eight individuals for a five-year period. The lot itself was therefore the most problematic event, certainly the least convincing, and the weakest point in the chain of arguments defending the procedure, while references to the Arab and Islamic “roots” of the conscripts seem like reassurances to calm a frustrated populace. Such reassurances, however, are balanced with the threatening tone of the last passage. [Once the date of the lot has been fixed,] you should, you, the addressees, meet in one place with all those who must attend [all males of the required age category] as stated in the aforementioned law. You will create with the official [ma’mūr] a majlis [or draft board] to proceed with the lot [ḍarb al-qur‘a: beat the lot] according to the established principles [uṣūl] of the law [without confederation [bilā ḥilāf]? ].10 You should proceed with the lot without bias or ill behavior [inḥirāf] [against someone]. Those who will be selected will have the opportunity to go back home and stay there for twenty days while pursuing their usual businesses and tasks. On the twentieth [of the month]11 they should go back to the same place in which the lot was drawn and from there they will be sent, with prior knowledge of an official, to the area specified for them... If anyone was chosen by lot, then allowed to go home [waṭan: country, nation] to take care of his business, and then runs away and never comes back in the due date, he will have the officials searching for him all over so that the earth will look small, and he will surely be captured and subjected to punishment as requested by law. 25The threatening tone coincides all too well with those final and concluding statements, the only ones directly addressed to those directly concerned, namely all males of a certain age who will be directly targeted and randomly selected. While the only reassurance given is the twenty days of grace they could spend at home with their families, the five-year conscription plan must have disrupted many lives and those of their families and their labor relations. In fact, even though the number of forty-eight conscripts is not that demanding for a city like Beirut (one issue remains unsettled though: How to proceed concretely in the drawing of names? Were all names recorded based on the completed census? ), it must have disrupted far more lives and annoyed many families attempting to flee the draft. As the number of draftees grew larger and larger over the years, potential conscripts attempted to create new excuses: besides the possibility of a medical handicap, or an affiliation to a religious order, an early marriage would be another excuse. 26Our first sample of sultanic legislation already points to serious divergences in both the legislative and adjudicative styles between sharī‘a and sultanic-based laws. Even though that is to be expected, it poses questions on how the two systems coexisted side by side, and whether they did relate at any level. The Beirut sharī‘a registers for that period (1843-60) do not carry any case on conscription: Why then was a copy of the above firman kept as part of the courts records? One possible explanation is that the courts were indeed the main source of law and its primary space of adjudication, and that judges, even though they never handled conscription matters, would be consulted by young men and their families on the legalities of the draft. In short, the courts, even if sultanic legislation was not meant to be part of their jurisdiction, were at least responsible for disseminating its content. In fact, as I argued in Chapter 9, judicial policy making was mostly limited to the regional councils, so that a great deal of sultanic legislation must have been aimed towards the latter, without, however, ignoring the courts. Moreover, it is to be expected that the courts did use at least some of that legislation, even though the scope and depth of such legislation, if it did exist, remains uncertain until more research progresses in that direction. 27What we know for certain, however, touches upon the very principles of sultanic legislation and its major differences with Ḥanafism. The latter was construed along a logic of reasoning and adjudication that heavily relied on canon, so that each act of ijtihād consisted of a method that constructed texts from a juxtaposition of older fragments, all of which were re-contextualized for the purpose of a problem-event. By contrast, sultanic firmans had obviously neither such ties to the past nor to authoritative figures, nor were they even limited to a madhhab. That explains their freer form and syntax. Thus, if the deep roots of the sharī‘a courts was their main social asset, the strength of the “state” judiciary came precisely from its non-reliance on tradition, hence its ability to legislate and adjudicate on matters that Ḥanafī practice would not handle with ease. A case in point were policies that covered loans with interest, in particular if the profits of the lender were high enough to suggest usury. 28[C 10-2] A firman, received in Beirut and dated April 1852, aimed at regulating what was thought to be excessive gains from money lending, and targeted excessive ribā practices without ever mentioning them by name. As in the previous firman on conscription, the ribā text is in Arabic and with no accompanying Turkish text, has no title, and begins with the usual list of prestigious addressees: the wālī of Sidon, the head of its respectable majlis, its defterdār, Beirut’s chief judge, and finally, some judges in the same province. Since the ribā had to be euphemistically named, the firman only indirectly tempered the ribā by fixing a percentage of profit on moneylenders. The taboo appellation had to be replaced with more general names denoting profit making with no reference to usury as such: murābiḥ-ūn and aṣḥāb al-tharwa were two of the most common euphemisms hiding the usurious activity of the moneylenders whose profit margins the firman was attempting to reduce (or at least regulate). Thus, the word murābin (from ribā) has been avoided altogether and replaced by murābiḥ, which derives from the root ribḥ; while murābaḥa, also from the same root, is a resale with a stated profit, or a markup contract,12 all of which denote an activity of selling a commodity with a known profit (ribḥ ma‘lūm), thus assuming that the sale price is indeed higher than the original one: it is as if the text is saying that some individuals are making profit (ribḥ) by lending money but without practicing usury, and we need to legalize that profit by fixing that profit margin. The term aṣḥāb al-tharwa, the wealthy, is even more neutral since it even avoids profit-making margins. 16 This firman could not be located. 17 An incorrect use of aqsāṭ. 19 Beirut sharī‘a courts, unnumbered register, p. 145, end of Jumāda II 1268 (April 1852). 20 I was unable to locate the text of the earlier firman. 29Money lending, at twelve percent, and with an official increase of four percent over a previously unspecified period,20 has been legalized in the sultanic text. Does this imply that the interest gained as profit, or the amount of credited money, ought to achieve the status of a māl mutaqawwam, that is, that of a legally protected transaction?21 If the answer is affirmative, then a moneylender who, a year after lending his money, was not reimbursed according to the clauses of the agreement, could file a lawsuit against his debtor and be legally protected against the latter’s inability to refund. In other words, the object of the transaction itself, if legalized, becomes a māl mutaqawwam: but will the courts protect it as such because of the new stipulations? To be sure, such measures do represent a departure from Ḥanafī practice which never bothered into looking at margins of profit per se, but simply condemned usury globally as a money-making device out of “nothing.” Ribā is indeed considered unlawful because it implies exchanging māl for something nonexistent (ma‘dūm) and because the exchange is unequal: the money, refunded later, is of greater value than the original one; but Ḥanafī practice had nevertheless to admit customary practices such as istiṣnā‘, salam, and bay‘ al-wafā’, even though all of them implied investing into something that had no existence yet. But if usury implies making excessive gains (ribḥ fāḥish) out of something that has no existence (ma‘dūm), two problems arise: 1) either any profit—however low—generated out of lending money is illegal—money is therefore not looked upon as “any” commodity for exchange, but simply as a non-‘ayn whose “value” is what renders exchange itself more convenient and manageable under certain conditions22 (if barter is to be avoided); and 2) if exchanging money for money is legally valid within certain conditions, it then all becomes a matter of quantifying the legally accepted margins of profit, which is precisely what the firman attempted to do: otherwise how is it possible to distinguish usury from a regular markup contract? The point is whatever we think the Ḥanafī position might have been—it has in effect hovered between (1) and (2), while leaning more towards (2) when customary practices became a de facto standard—it never legalized any specific margin of profit. On both counts, therefore, the firman constitutes a transgression. 23 Ibn ‘Ābidīn, “Tanbīh al-ruqūd ‘ala masā’il al-nuqūd,”in Rasā’il,2:55-65. 30In effect, Ḥanafīs, even when on rare occasions digressed on matters of money, never discussed its nature per se. For example, Ibn ‘Ābidīn’s short essay on money only limits itself to price fluctuations, devalued or obsolete currencies, hence to shifting values that might arise among contracting parties.23 And even though money-as-nuqūd was classified as māl—and, more specifically, as māl bāṭinī due to its hidden “invisible” character—it was still not looked upon as a tangible object, ‘ayn. In other words, money was to be perceived as a special kind of object, a non-‘ayn whose sole purpose was for the “evaluation” of exchangeable commodities. This is particularly helpful for non-fungibles. But if at times a commodity has to be exchanged for money, money cannot be exchanged with itself, or at least if it was, then no “price” must be paid for that exchange. Perceived therefore solely as a “tool” for exchange, it thus became next to impossible to conceptualize money as having “value” all by itself whose “use” has a price (e.g., the payment of an interest). Hence neither the logic of “pricing” ever became an issue, nor was the logic of exchanging money for money ever raised at an analytic level. 31Usury was common during the first half of the nineteenth century and probably expanded even more massively during the Egyptian occupation (1831-40) at a time when the presence of the European commercial houses and foreign traders spread more easily in both Beirut and Damascus (they had already been well integrated in Aleppo since the seventeenth century). The gradual commercialization of land and its produce increased the pressures on landlords, the peasantry, the multazims, and all intermediaries to push for greater production within larger profits, as there were numerous factors that might have created larger margins for a money-market economy. All this meant more exchange of goods and services, both at regional and inter-state levels, and a greater need for cash. Money lending, though illegal, was nevertheless accepted on a de facto basis;24 it then spread to such a degree that its regularization became a must. Early in the nineteenth century, money lending was limited to mostly wealthy Jewish ṣarrāf families located in Damascus; others did participate but at a much lower scale. By the middle of the century, with the movement of restricted commercialization that had swept agricultural production in Greater Syria, not to mention the newly promulgated Commercial Code in 1850, from which the 1852 firman adopted the twelve percent annual rate, the circle of moneylenders expanded considerably so as to include merchants, craftsmen, and landowners from Damascus.25 By the 1880s, if not before, a commercial court in Damascus had already instituted the practice of money lending and legalized it by creating distinctions between the three dates of payment, protest, and convocation. But while by that time the creditors formed a wide array of wealthy merchants, landowners, and some of the consulates’ employees, the debtors were mostly peasants—an indication that money lending was mostly tied to agriculture and that part of the agricultural surplus was transformed into cash in urban centers, and then reinvested in the same cycle of production. 32Typically, when interest rates are higher than the yield on the land, the movement of land commercialization becomes redundant, so that both the exchange of land and cash lending are rare activities protected by all kinds of legal and extra-legal devices. Thus, once land is freed from the usual constraints and its commercialization becomes the norm, interest rates are brought much lower than their hitherto known rates of 20 to 30 percent. But in the ancien régime economies, interest rates were also high because of the risks of lending, storing, moving, and transferring money, not to mention, of course, the inadequacies of the judiciary when it came to the taboo question of interest rates. 33The 1852 firman should therefore be looked upon as a prelude to the vast movement of money lending that swept Greater Syria in the decades to follow. The first proposed annual rate of eight percent was probably not accepted by moneylenders and considered not realistic as being too low (no date was specified as to when that rate was adopted). The state authorities were therefore forced, mutatis mutandis, to accept the twelve percent rate (what the firman did was probably to legalize the most commonly accepted rate, already in effect since the 1850 Commercial Code). 34Besides imposing a new interest rate on loans, the new firman also pushed towards a unification of all rates. Apparently, a previous firman had permitted a special rate on money that was credited by orphans or waqfs: even though the text describes it only as a “special law,” the exclusive regulations came with special interest rates. But could such rates have been higher than the previously legalized eight percent? Would it make sense to charge more when anyone could get it for less? It only makes sense therefore to envisage lower rates for the orphans and waqfs money. Surprinsingly, that rate was much higher, and no wonder a readjustment was long overdue. Since the funds of waqfs and orphans26 enjoyed [as stated earlier] a special status, their profits [murābaḥa] should be settled according to the old [rate] of six piasters and a quarter [15 percent]. The moneylenders [murābiḥ-ūn] who have lent their money prior this date on the basis of six piasters and a quarter per kīs, should have their accounts [ḥisābāt] looked upon based on the receipts [tamassuk-āt]27 they kept. But those who did not follow [this rate] and lent money with a high profit [murābaḥa fāḥisha], their accounts should be looked upon from the payment date, and their profit should be set on the basis of five piasters per kīs, namely twelve percent, and every increase should be brought down [to that rate]. As to the poor who do not have much, their debts ought to be settled by agreement [bi-l-tarāḍī] from both sides, i.e., based on new receipts with one- to five-year installments. 28 Calculated as follows: (6.25/500 x 100) x 12. 35Interestingly, the old fifteen percent rate28 for the waqfs’ and orphans’ loans, while only three percent higher than the newly legalized rate, was seven percent higher in the previous system. But those who had already offered their credits prior to April 1852 were left with the opportunity to impose the same old rate on their debtors until all payments were completed; while those who lent money with rates higher than or equal to fifteen percent had to adjust them to the new low rate. In the old system therefore, the waqfs’ and orphans’ loans were privileged by almost twice the regular rate of eight percent: besides a social logic that could have imposed such large variations, how was it possible, based on pure economic logic, to keep two official rates with so much difference? One thing is certain: had the system worked out properly, there would have been no need to reconsider the two-rate system; and the 1852 rate was in between the two older ones. What might have happened, after the first monetary regulations came through, was that independent moneylenders refused the lower interest rate imposed upon them and went with the higher fifteen percent, while waqf administrators and guardians of orphans’ money charged even higher rates, hence the “difficulties and problems” alluded to at the beginning of the firman. 36After the “general regulations [niẓām ‘umūmī]” have been thoroughly described, the text directly addresses, once more, its original addresses: “You, the aforementioned wālī, and the head of the majlis, etc.” The purpose was to hold them responsible for the dissemination of the new regulations: “our decree [irādah] should be announced and disseminated in all places under your control so that it be applied in all sharī‘a courts and the majālis of the provinces [bilād]...” Such an organization also implied that both creditors and debtors could no longer act on their own but only under an official umbrella. 29 Dayyinmeans religious and pious, and is incorrectly used here in lieu of dā’in, creditor. 30 No punishments were specified. 37The notion of “loan (qarḍ)” is introduced only in that concluding passage. That the text manages all through to impose new regulations on money lending while avoiding the fact that “profit” is based on “loans” is indeed surprising, but it shows how much cautiousness and linguistic strategy are important whenever non-religious officials are stepping into a territory in which Ḥanafism applies. The firman thus manages not to step into the jurisdiction of the sharī‘a courts: 1) by avoiding any direct reference to usury (ribā); 2) by ignoring all suspicions that Ḥanafism has contributed towards usury in particular and money lending with interest in general; 3) by limiting the text to murābaḥa, a form of markup contract; and, finally 4) by creating an implicit demarcation between murābaḥa and the practice of loan-with-interest, ribā; the former had thus been legalized and regulated while the latter remained taboo. 38The firman also imposes, regarding all loans with interest, written contractual statements so as to be legally binding; this is another domain where sultanic legislation has circumvented Ḥanafī practice. In fact, as most sharī‘a court cases show, since covenants could be orally performed without any ensuing written statement, they would become legally binding in a court litigation if plaintiff and/or defendant are able to furnish evidence in the form of witnesses. Indeed, an essential aspect of fictitious litigations, as described throughout this study, was to transcribe in writing the various contractual settlements and ownership transfers that the disputants had orally concluded. What the present firman does, however, is to require written statements for all loans, which would also have to elaborate on the interest rate, mode of payment, and date of maturity agreed upon. Even though the text does not openly disavow oral covenants, the requirement of “receipts” at every juncture does suggest that it would be hard for the newly established councils to accept a covenant as valid if orally concluded. Moreover, the sharī‘a courts would not be able to handle such cases either because of procedural limitations, or that it was not in their tradition to specify profit rates. Finally, the firman indirectly acknowledges that money is a commodity that could be exchanged in lieu of a margin of profit that the borrower pays to the lender, or in the jargon of Ḥanafism, money achieves the status of a māl mutaqawwam that is legally protected. 39Neither conscription nor loans with interest are Ḥanafī strongholds, and that is precisely why sultanic legislation stepped in. In fact, even the existence of such texts among the daily routines of the sharī‘a courts points less to how much the two legal spheres were in need of one another, and more to their marriage of convenience: both firmans found their place within the courts registers, but not a single case between 1843 and 1860 had any relation to either conscription or payments of interest loans. (The Damascus regional council carried few such cases.) Clearly then the purpose was simply to let the judges know and keep them informed so that they in turn could act as consultants to whomever might be concerned. But the direct, and often impatient, language of the firmans hides too well how much such texts were mindful of all the constraints under which Ḥanafī practice was operating. Since the firmans had to step over the jurisdiction of the courts, there could be no harmony between the two since the former were transgressive to some of the main precepts of the fiqh; but only a balanced policy would circumvent the major stumbling blocks of tradition while creating that parallel legislation. That is why describing one system as religious and the other secular and rational is misleading. For one thing, the firmans of the 1840s and 1850s shared very much an ad hoc approach to all kinds of impending issues, and in the absence of a more systematic line of thought, their rationality remained very partial. In fact, only the fact that sultanic legislation operates without the constraints of Ḥanafism gives it that lay character, one that deprives it of its clerical tradition. Even if we believe that legal systems are more the outcome of practice than logic, the confused identity of the firmans ties them to several conflicting worlds rather than to a well defined logic. 40[C 10-3] If Ḥanafism did not regulate conscription, or carefully assess profit margins, customs (gumruk/gamārik; written kumruk in a mixture of Ottoman-Arabic)31 fell too outside its scope. Hence we see a firman, dated February 24, 1846, a copy of which was kept in a Beirut court register, devoted to the land and sea customs of the empire. 41Like the previous firmans, this one is in Arabic only, and addressed to the familiar set of personalities: the wālī of the province of Sidon, its defterdār, the mutaṣarrif of the sanjāq of Jerusalem, the mayor of Acre, the chief-judge of Jerusalem, and finally, to all the ‘ulamā’ who were either customs agents in seaports (kumrukjiyyat al-asākil), or members of the majālis, or simply the a‘yān (referred to as wujūh al-bilād: the faces of the nation) of the provinces of Sidon and Tripoli. The list is therefore much broader than the previous ones because of the scope of the matter: customs and tariffs; the choice of the personalities had therefore to conform to a wide territory covering sea and land customs in relation to both Beirut and Sidon (such as Jerusalem, Acre, and Tripoli). Left with a non-specific title—“Copy of a highly important firman”—the firman was drafted in a very poor Arabic, and looks more like a poor interpretation of the Turkish original (for which no copy was provided, assuming that an original did exist). The aim was a reorganization of customs duties—or, more precisely, the obscure link between land and sea customs—in parallel to a new division of commodities between those locally consumed, and hence could be exempted from taxation, and those in transit to other provinces, if not to other countries, and to be taxed at their port of shipping. 32 This locality could not be identified. 33 Colloquial plural of dhakhīra, whose plural is dhukhr. 34 The text says qaḍāwāt, a colloquial use of aqḍiyah, plural of qadā’. 41 Could not identify the meaning of the term and the role of this specific tax. 42 Beirut sharī‘a courts, unnumbered register, pp. 196-97, 27 ṣafar 1262 (February 24, 1846). 42The firman’s introductory passage is already confusing, and even though the overall meaning will get clearer only towards its end, a preliminary recapitulation is nevertheless worth the effort. (1) There were two types of customs, the old and the new, and some, if not all, of the new might have been dropped and the purpose of the firman was to remind of the old taxes that were levied on both land customs or seaports. (2) Goods were categorized according to either local or outside use, that is, they were either locally consumed, and hence not subjected to taxes, or were in transit to another location, and hence taxed accordingly. (3) Five types of grains (see below) enjoyed a special status and categorized apart from the other commodities. (4) It is not clear how customs duties, whether old or new, in Anatolia or Rumeli (since those were the only two provinces singled out in the firman), should have affected the circulation of commodities in Greater Syria (to which the firman was addressed in the first place); the text in fact avoids any mention of the major seaports of the region where the bulk of customs duties were levied: Tripoli, Beirut, Sidon, and Acre. (5) A notion of a fragmented space begins to emerge: space looks as if controlled by several deeply infiltrated local powers (to which the firman devotes a lavishly drafted introduction) to which concessions had to be made for a successful implementation of the new regulations, and to which other regional powers had to succumb. The relations between the two on the one hand, and the central authority on the other, determined how freely commodities circulated between provinces, or how they were taxed; in fact, distinctions between land and sea customs, old and new, were an outcome of regional and urban power-relations and their struggles with the central authority. 43In this segregated space, subject to so many negotiations, locations (referred to as maḥallāt), tax-duties, commodities, and above all people fell into hierarchies depending on their nature, substance, and social (hence economic) status. Thus, while the middle part of the text focuses exclusively on some foodstuffs such as (cooking) fat, oil, sesame, rice, honey, molasses, and cheese, all such products, essential as they were to the cooking habits of the people of the region, were taxed once delivered in any of the seaports; but if by 1254/1838, no tax-duties were imposed on those products, that would imply that the specific location (maḥalla) to which they were to be delivered had no customs: new ones should have then been created by that time. Those products which “used to be shipped by land [to a seaport] and the customs were all land customs.” The majority of sea customs were then created by 1838 for all localities that did not have one, and the corresponding land customs became obsolete: what the firman was attempting to clarify was which duties should be imposed and where. Giving a preference to seaport customs was probably a way for the central authorities to better control taxation; but in the meantime, some of the old land customs kept apparently functioning either out of confusion or by pure abuse from local forces. 44As in the previous firmans on conscription and money lending, a tension survives in the text from the fact that the legislators were attempting to convince their addressees of the benefits of the new regulations, either the new conscription system, or the new interest rates, or the newly created sea customs and their corresponding taxes. But the legislators did so only with a cautiousness that translates into left out assumptions. Thus, concerning the foodstuffs enumerated above, the text made it plain that no duties should be imposed on them whenever they were destined “to the populations who need them for their food and to the poor for their basic needs.” Not only such statements, destined for local consumption, were difficult to apply (what would be the criteria for poverty? ), but they only helped in creating circles within circles of hierarchies within an already parceled space: thus, those “tax-free” foodstuffs in the newly erected sea customs (post-1838) still had to pay some of their “old duties (rusūmātihā al-‘atīqa)” for delivery and market inspection. Moreover, space fragmentation also implied that orders be issued individually to the military police chiefs (mushīr-īn) of Anatolia and Rumeli, the wālīs of the provinces, their mutaṣarrifs, defterdārs, a‘yān, and all officials responsible for levying customs duties: it is as if the state authorities had to re-negotiate the actualization of its firman with everyone on the ground. 45Interestingly, only in the concluding part does the firman address itself in the first person singular: my order, my firman. That in itself is enough to create a dramatization effect: the sultan as the sole ex officio legislator addressing himself directly to his ra‘iyya and their ex officio “representatives.” Such a step proves even more dramatic once the text addresses itself to the judges of the sharī‘a courts: that is, to the other equally important source of legislation where the law was to be applied. 43 More accurately: al-ḥubūb al-khams. 44 The addressees were probably here the ‘ulamā’ and judges. Once my firman, with its noble imperial title, reaches [its destinations,] its content shall be explained [tafhīm] to everyone concerned; and my high order will be implemented [yunaffadh] in the sijills of the [sharī‘a] courts, as stated above, so that the five grains [al-ḥubūbāt al-khamsat]43 [wheat, barley, Egyptian wheat, corn, and fodder] and their flour are destined to all places. Those are not subject to a customs tax [rasm kumruk], and with your44 opinion, knowledge, and the knowledge of the honorable shar‘, and the agreement of everyone with me, it was decided that a customs tax should be levied on the commodities and things that are shipped by sea, as stated above, in the seaports that already have [new?] customs; and those who have old land customs, a custom fee is imposed on [foodstuffs] shipped by land to those places, such as fat, oil, sesame, rice, honey, and brands of molasses and cheese, based on the fee list. And in case this does not apply [to some localities], such as the qaḍā’-s and nāḥiyas located on coasts with seaports and to which land customs have been created prior to the year 1254 , no customs duties should be imposed on fat, oil, sesame, and the other listed products [above]; only the iḥtisābiyya and the other old duties should be collected based on the [latter’s] principles and regulations [uṣūl-ahā wa niẓāmu-hā]. Tax duties on cooking fat, oil, sesame, rice, honey, molasses, and cheese. (1) No customs duties on oil, sesame, etc. (2) Only the iḥtisābiyya and other old duties should be levied on the products listed in (1): this applies only if those duties had already been collected in the past. (3) In case all the above products are not destined to be consumed locally in the first place, and are to be sent to seaports in order to be shipped to other localities, the āmadiyya and raftiyya customs duties should be collected. 45 The text wrongly uses the colloquial musā‘afatī instead of musā‘adatī, my help. 46The firman’s overall purpose was therefore to clarify the relationship between new and old customs. That said, the deployed strategy takes several twists and turns worthy of consideration. In a section preceding the above quoted passage, the text shifts from the third- to the first-person singular, thus representing the sultan as both legislator and addresser: this is done to highlight the tension between what is being said and proposed, on the one hand, and its implementation (e.g., at the regional borders and urban councils) on the other; it also helps in highlighting apparent failures in previous implementations of similar regulations, and does so by having an “I” address itself directly to the groups concerned: “[my own firman is intended to insure] my exalted imperial help45 to the aforementioned inhabitants [of villages and localities] as long as the merchants do not [as they did before], and contrary to my will, misinterpret the last regulations designed to collect customs duties on movable things. Appropriate punitive measures [tādībāt lāyiqat]46 [will be implemented] to find who is the cause [behind a bad implementation of this firman. ]” The text then overtly wishes the firman to reach its destinations as soon as possible so that its ethos would disseminate among all those concerned. The legislator and firman’s interlocutor therefore looked at his own creation not simply as a set of orders to be obeyed, but, more important, as a textual construction whose cultural ethos he expects to be properly disseminated and understood. An anguished tone pervades throughout for having been misunderstood in the past and out of fear for a possible repetition of such misunderstandings in the future. Thus, the textual strategy consists in (1) positing the legislator-interlocutor as the victim of grossly manipulated misunderstandings; (2) some groups (among them merchants) could have contributed to all this because the new regulations were not beneficial to their interests; (3) if understood properly, the firman would look all too human: some products, such as the “five grains,” were not taxed because they were part of the basic foodstuff of the poor; while others were partially taxed; and (4) the text underscores distinctions among people, products, regions, and types of customs and customs duties. 47Such strategies are indeed common to “legal” texts that are heavily personified and not based on a coded system. Instead of simply stating in an abstract and systematic code what the rules and laws are, the text proceeds by creating a “person” as an interlocutor, who coordinates with the role of the legislator. “His” global role, however, is not limited to legislation but to also justify the system and all newly promulgated laws. “He” thus must convince, prove, persuade, accuse, and threaten. At times, he must even point to specific individuals and groups: naming makes them directly responsible for the dissemination of the text’s meaningful purpose as intended by the legislator. In fact, in all three firmans the text deploys a strategy constructed around an anxious perception that a misunderstanding between legislator and addressees is always possible. First, it does this by raising the possibility that the text might be misunderstood by its addressees; that was related to difficulties in understanding texts in general and new regulations in particular, or to linguistic and cultural barriers (many firmans were drafted as bilingual texts with a heavy use of colloquial Arabic). More seriously, though, firmans were more concerned with deliberate attempts to manipulate texts and willful misinterpretation of them—precisely by those same addressees—whose economic and political interests might clash with the new proposals. Second, and considering that the first set of noble addressees were in principle only the “intermediaries” to the sultan’s ra‘iyya, the firmans play at times on the ambiguity of the ra‘iyya’s interests versus the notables class as a whole. Because firmans tended to represent themselves as legislated for the sole purpose of taking care of the people’s interests and well-being (with a particular emphasis on the poor and needy), a hidden assumption loomed over the surface: that a poor implementation of those regulations, or their misinterpretation, or simply the fact that few even knew about them, were all the outcome of the policies of the dominating regional élite groups (due to opposing interests, or attempts to maintain their coherence in the troubled period of reforms, etc.). In short, firmans kept harping on the assumption that they were indeed either unknown or else misunderstood by the general public, or, worse, that they were the subject of gross manipulations. 48Ernst H. Kantorowicz pointed to a medieval juridical technique known as the aequiparatio: the action of considering in equivalent terms two or several subjects who a priori did not belong and had nothing in common.47 For example, the church, a city, or a madman were from a technical point of view formally equal, because considered as “minors,” as they were unable to take care of themselves and their own business; each one therefore needed a tutor. The law proceeded by a method of “equalization”48 that brought together, under one legal framework, very different institutions, corporations, and individuals. Needless to say, such a method had immense implications beyond the juridical. Thus, the legislator who created legislations and judgments with no textual “precedent” relied on divine inspiration: his ex officio action was based on an imitation of nature—hence on an equalization between the creativity of nature and that of the legislator—rather than on an artistic or poetic genius (the association—or equalization—between the creativity of the legislator and artistic genius was to be brought later in Dante’s Divine Comedy). 49 Ibn Nujaym, “Risālāt,” 104a. 49The method of equalization was also commonly used in Ḥanafī practice even though its origins are uncertain. In one such case encountered earlier, the ra‘iyya were looked upon as orphans, with the sultan acting as their guardian: “The imām was appointed [nuṣṣiba] administrator [nāẓir] over the interests of all Muslims. And it was stated in [Ibn al-Humām’s] Fatḥ al-qadīr that [by analogy] he acted as the guardian to an orphan.”49 The purpose here was overtly political and economic: by reducing all the ra‘iyya to the status of orphans, thus equalizing them under the legal category of “incompetents” and “immature,” the sultan had full possession of their properties—a legal fiction that was common throughout the Ottoman period to justify the massive state ownership of lands. The political implications behind such justifications were enormous: it justified legislations and political decisions that were enacted without ever consulting the ra‘iyya. 50[C 10-4] Equalization also became an important tool in sultanic legislation (even though the history of such practices is far from receiving the attention it deserves). In a firman dated October 14, 1866, during a period of intense legal reform, four different categories of individuals were equated under specific legal procedures: all individuals, whether Muslims or non-Muslims, male or female, who were beneficiaries of an inheritance, were subjected to special procedures in case they were minors, madmen, handicapped, or traveling abroad. Thus, those four broad categories of individuals, minors (who were also orphans), madmen or madwomen (majnūn aw majnūna), the handicapped of both sexes (dhū aw dhāt ‘āha), and travelers abroad, even though they did not share anything in common—why should a traveler be “associated” with a madman?—became by virtue of the law a common legal category under which judges could adjudicate. The only element that brought them together, by means of analogical reasoning, was that they were all beneficiaries of inheritances of persons who had just died: the logic was that such beneficiaries were either immature (the minors), or mentally or physically unfit (the madmen and handicapped), or unavailable (the travelers) to conduct their business on their own and hence benefit from the inheritances without running the possible risk of duress or manipulation by others. So, the law poses itself as the sole protector of such individuals: it creates a special legal code for them, and any unauthorized use of their properties would have been perceived as unlawful. 51The syntax of the firman is much different from the previous ones. For one thing, the 1860s was a period of intense judicial reforms: the Ottoman legislators and reformers became fully aware of the importance of the systematic and rational character of the nineteenth-century French codes beginning with the Code civil or Code Napoléon (1804), the Code de commerce (1807), and the Code pénal (1810); and the laws promulgated during the second Tanẓīmāt period reflect a desire for systematization and bureaucratization (the two go hand in hand). Such a desire was visible in the establishment of new courts in need of clearer more coherent codes, and the limitations imposed on the traditional sharī‘a courts which reduced them to personal status matters (this dual system still works today in both Syria and Lebanon in roughly the same way). But even though the 1866 firman was primarily destined to the sharī‘a courts (and a copy was kept in one of the sijills),50 because matters of succession (tarikāt) were still within their jurisdiction, it followed an organizational structure that characterized later firmans and codes (including the 1877 Majalla, based on the traditional Ḥanafī literature): divided into sixteen numbered articles (mawād), the text was handier for consultation than older firmans. 52The first article begins with a clear request to the local authorities in order to immediately proceed in preparing a succession (taḥrīr tarika) of a deceased person who, included among his beneficiaries, were at least one of the following: an orphaned minor,51 a madman, a handicapped person, or an absent inheritor (ghā’ib), all of both sexes, whether Muslims or non-Muslims. Such successions were to be prepared in the sharī‘a courts (Christians, according to the fifth article, had to follow their own procedures) with the knowledge of the imāms, mukhtārs, and priests of the villages and other locations (maḥallāt) who, in turn, should immediately inform the government (al-ḥukūma)52 of such special successions (that is, limited to the four categories). The aim of such an enterprise was to create a “treasury for the orphans (ṣundūq al-aytām).” Interestingly, even though the other three categories were totally unrelated to the orphans as such, they were still subsumed under this broader umbrella of orphanage. Thus, indeed, orphanage did act as reference to all four categories since it was in a way the model to which all others were analogically related: minor orphans, because of their incompetence, do “naturally” need a guardian, and that kind of image became legally and politically dominant in the Ottoman empire to legitimize the state massive ownership of rural lands. The other three categories—the madman, handicapped, and absent beneficiary—were the ones “equalized” to the norm—that of the incompetent minor orphan in need of guardianship. The two key legal notions were therefore incompetence and guardianship: this made it possible for a group of people, either individually or collectively, to act on behalf of others, dispose of their movable and immovable properties, and, in the sultan’s case, make political decisions and legislate on behalf of his ra‘iyya without any prior consultation with those concerned, thus de facto ruling out a legitimate delegation of powers. 53Equalization was therefore the first method, among several legal notions, which brought together four different groups of individuals. That also implied full submission to their appointed guardians, and because of the alleged incompetence of those individuals, the implication of equalization was that some individuals—defined by law, as an outcome of their incompetence, as equal in status—had their entire wealth in the hands of others (their guardians, but also as the state’s public property). In fact, the outcome of this whole “orphans fund” was only explicitly stated in article seven: to create a system of loans with interest from the orphans’ movable and immovable properties (amwāl al-aytām). Such a fund should have in principle been established in every qaḍā’ of the empire and its use was to be public: in other words, after fulfilling some conditions imposed by law, individuals could borrow amounts of cash from those funds; interests were charged, and those interests were to be added to the fund. Thus, orphans funds did (assuming that the whole enterprise worked well enough as prescribed by the firman), grosso modo, what all banks do today: lend money to particulars and charge them with specific interest rates. The enterprise could also be seen in conjunction with an earlier firman (C 10-2) legalizing and setting limits to loans with interest. 54Besides the first major legal step of equalization, creating such a fund implied an even bigger judicial move. To be sure, establishing a “public” fund out of movable and immovable private properties was no ordinary step, even by Ottoman legal standards. Indeed, such a step implied “confiscating” privately owned properties and placing them in the public domain for the public good. The confiscation, however, was in theory for a limited period only: once the minor matured s/he enjoyed the full legal right to appropriate his/her properties; the same applied to the absent beneficiary who returned home, and the madmen/women who gained reason, or the handicapped who was cured—all of them, once achieving the status of “normal,” could make full use of their (inherited) movables and immovables.53 Two questions need to be posed at this juncture: 1) What were the judicial foundations and precedents behind such a public appropriation of private funds? and 2) How were the madmen and handicapped to be determined: according to which medical criteria? And why would a handicapped person be perceived as mentally unfit to take care of her properties? Obviously, the assumption here was that minors and absent beneficiaries would be easier to delimit, even though the category of “absent” might end up confusing: How far away should a person be, and for how long? 55Sharī‘a law did demand guardianship on some categories of individuals, such as a minor orphan and a madman, on the basis of a mental incompetence, but it did not suggest, however, transforming their properties into public funds from which particulars would borrow money (loans with interest were anyhow forbidden). The only legal precedent that comes to mind here, as mentioned earlier, was that of the sultan acting as guardian over his ra‘iyya’s properties; but that was on the basis that those properties had their owners die without heirs—the legal fiction of the death of the kharāj payer. Private lands thus became public properties (arāḍī amīriyya), owned by bayt al-māl: that was a legal fiction to represent the sultan as effectively disengaged from “public” landownership. No clear precedent was thus available in transforming private properties into a quasi-public fund. From the point of view of sharī‘a law, therefore, such an enterprise would have been strictly illegal because loans with interest were unlawful. 56However, one of the general Ḥanafī rules states that “private guardianship is stronger than a public one [al-wilāya al-khāṣṣa aqwa mina al-wilāya al-‘āmma]” (Majalla, 59), so that a judge has no right to decide on his own what to do with a minor’s fund or a waqf as long as a guardian, tutor, or administrator is available. But—and that’s the main point in favor of our firman—a judge may nevertheless use a minor’s fund as a source for lending money, while the guardian or tutor do not share such a privilege, and the reason for giving the judge such discretionary powers lies in the fact that looking after waqfs and orphans is a “public interest [ḥaqq ‘āmm],” thus explaining the limitations that guardians are subject to in that respect.54 Yet, it was still a long way to go from the authority of the judge to that of the sultan, and Ḥanafīs did assume that such rules originated solely from the fiqh itself, and that the judge was the “public figure” in such matters rather than the sultan. Moreover, the conflation of interests that might occur between the fiqh and sultanic legislation was perceived by Ḥanafī scholars as part of the maṣāliḥ mursala, that is, all those public interests which are neither condemned nor particularly recommended, and which the fiqh only temporarily accepts faute-de-mieux on the basis that not doing so would harm the interests of common people. 57The framing of the sixteen articles leaves out the issue as to who would be responsible in determining the sane from the insane and the handicapped from the normal: what if someone was physically disabled but mentally capable? Sultanic law here simply followed the shar‘ in the general implicit assumption that the insane, disabled, and invalid were all to be “discovered” in their “handicaps” by their “community” (in particular the family).55 In other words, objective criteria for insanity had not been worked out by an autonomous discipline such as medicine, as was the case in early modern Europe. 58The procedures for transforming privately owned properties into a quasi-public fund that in principle was still owned by its original beneficiaries are worth following in detail. The second article demands that the local government56 draft a “daily attestation”57 detailing all the “happenings (wuqū‘āt)”58 of the day in terms of all deceased individuals with an inheritance (or part of) that would be subjected to the new regulations; in that case, the succession should be completed as soon as possible and all relevant information was to be submitted to nā’ib Efendi (deputy to the wālī?). Moreover, in what the text describes as a “remark [mulāḥaẓa],” all properties and things inherited by the beneficiaries should be “sealed” by someone from the sharī‘a courts so that all “movable things [al-ashyā’ al-manqūla] do not get lost;” and such measures should be applied even during the period of the funeral and mourning: “because it would be inappropriate to force out the children and family of the deceased from his own home and leave them out at the moment of the funeral, it is therefore advisable that all valuable objects that could be hidden or lost, to be placed [for safety] in one room or two, or be boxed and sealed; while all things needed for everyday home use would be left with the beneficiaries.” The safety measures were therefore extreme, and considering that all those properties and objects were privately and legally transferred from one individual to another, they look quite extraordinary. In fact, the sharī‘a courts usually applied such draconian measures only when a problem emerged in the succession because, say, of a conflict between the beneficiaries, or when an official died far away from home (court registers do contain “orders (awāmir)” either addressed to the chief judge or to the wālī prompting them for immediate measures concerning the successions of some high-ranking officials). 61 Orphan (yatīm) is used as a generic term for all four categories. 62 “Orphans” between quotations marks is generically used for the four groups as a whole. 59It becomes clearer by the third article that the process was indeed one of seizure by the state of privately owned movable and immovable properties, and that the whole notion of “unfit to take care of your properties” played all too well as a pretext to convert some immovable properties into cash and make this money available as a public fund. It remains to be seen, however, how much weight the four categories of unfit persons effectively carried. The third and seventh articles clarify the essence of the process: first, convert as much immovables as possible into cash, and then place it into a public fund, while all properties that proved hard to convert in the process would also be used for other public purposes. Thus, the third article states that “whatever the value of the succession [left to the beneficiary], the properties and lands that should be kept as ‘ayn,59 in addition to few other things, which based on need [ījāb: obligation],60 [might turn out necessary to keep,] should be left to the orphan;61 while the things and amwāl that would be damaged [yulāḥaẓ talafu-hā] should be sold in auction, with the knowledge of the guardian and representative, at its fair price [thaman al-mithl] in order to transform it into cash [naqd].” Interestingly, this article recapitulates many of the “economic” categories that the fiqh worked out for centuries: namely, the distinction between a‘yān and amwāl, and how the tangible thing, ‘ayn, becomes an exchangeable thing, māl, or res in commercio; in turn, the māl could be exchanged with another māl, money for example. Thus, what was of interest to the committee responsible of the orphans fund (it had its own majlis) was the process of transforming as much a‘yān into cash (naqd), and the less a‘yān were left in the way, the better. Since the “orphans”62 were “allowed” to keep the properties they needed, the process was tied to what was meant by the “things that would be damaged” since that was the targeted category that ought to have been sold in auctions. 61The whole purpose of the enterprise was finally clarified in the seventh article: the creation of a separate ṣundūq (“treasury”) in each qaḍā’ in which all the cash paid for purchasing items from the successions had to go. Detailed lists were kept so as to make sure that each “orphan” had his cash correctly calculated. If someone wants to borrow money from the funds of the orphans kept in the treasury, he should present himself first to the majlis of the city in order to show to the majlis the things that he would like to deposit as security [rahana] or give in pledge. Once the insurance [for borrowing money] has been provided [and approved] by the majlis, the aforementioned treasury is brought to the majlis in the presence of the ḥākim, the majlis, and the treasury’s deputy (ma’mūr), in addition to a court’s scribe and the [orphan’s] guardian. The requested amount of money is then credited to [the borrower] from the orphan’s fund. Asking for a loan [istiqrāḍ] should therefore proceed at the sight of everyone, and [the money] is handed to the borrower after listing in the loan contract all things that had to be deposited as security, or the lands open to a possible farāgh transfer, or properties that could become the object of istighlāl. But in case the borrowed sum was only linked to a guarantee [kafāla], then each guarantor should be associated with a fraction of the loan. 62It was at this juncture that the private fund of the orphans became public and accessible to all borrowers wishing to receive loans on the sole condition that they furnished the majlis with enough guarantees (things, lands, properties, or persons). A key element in the procedure was that the borrower had to proceed with his request while “confronting everyone (bi-muwājahat al-jamī‘)” in the majlis: it is as if everyone becomes a witness in the process so that the purpose of those procedures “in the sight of everyone” was precisely to avoid loans on a one-by-one arrangement. But such measures would have also provided the majlis with a means to filter all applicants and limit the accessibility of the fund to only those whose economic and financial interests did not collide with its own: that was the case, for example, of the Damascus majlis of the 1840s—the first one actualizing the spirit of the reforms—it literally wiped out any competition from the other élite groups that were not included within its narrow circles of power. In the absence of a systematic source of documentation on the proceedings of the orphans fund, it is impossible to know to whom the loans were granted. 63Interestingly, at this stage, nothing was yet mentioned as to the interests to be charged on the loans. After all, the purpose behind this whole enterprise was, at the same time, to provide individuals with loans, and increase the fund’s volume. But with no interest rate suggested thus far, article eight comes a bit like a surprise: “The surplus [faḍlah] and growth [numuww] that are the outcome of the profit [ribḥ] of the landed properties of the [“orphans”] whose status remained as ‘ayn [that is, were neither sold nor exchanged for money] and kept under the supervision of a guardian, in addition to the growth that results from the profits on cash currencies [arbāḥ al-darāhim al-naqdiyya], should be [deposited] in the treasury every six months in the presence of the guardian and majlis. Once all present, the finances should be checked by opening the treasury and verifying the surplus remaining after the money spent [on the livelihood of the “orphans”].” Thus, what kept this fund alive and prosperous were two different sources of revenue: 1) the profit from landed properties that were not sold and whose income was mainly from tenancy contracts; and 2) profits generated from the cash fund itself through charging interest. Even though a direct reference to interest rates was avoided, the situation here was similar to that encountered in the 1852 firman making legal a twelve percent murābaḥa on cash loans (murābaḥa, a euphemism for interest rate or ribā, in case the rate is excessive, will be identified for the first time in article 12 of the present firman). The majlis’ policy vis-à-vis the orphans fund now looks a bit clearer. Properties that were thought to generate enough revenues were kept and leased to farmers or multazims; those that were thought potentially less attractive were sold, and exchanged for cash in order to generate more cash. The term “surplus (faḍlah)” thus refers to the cash surplus after deducting all expenses, which in this case were obviously the amount needed to sustain the livelihood of the “orphans.” (The twenty-per-thousand piasters of expenses to the director, dallāl, and courts were deducted prior to depositing the money into the fund.) Nothing was mentioned, however, regarding the majlis’ and guardians’ own expenses: were they doing all that work for free? Or, was it that, considering that they were presumably elected ex officio from élite groups, such funds provided them with sources of cash they badly needed? The other key term is that of “growth (numuww),” and as the 1852 firman shows, loans with interest were legally acknowledged from the first period of reforms (a pre-1852 firman even admitted higher rates for the orphans funds, prior to bringing all rates to a single level): but why was no specific rate imposed? Most probably, the fund had to follow the single-rate procedure imposed by previous firmans, even though that remains uncertain. However, not all social categories were equally treated: merchants, for example, were in need of a “strong pledge” and “several guarantors” (article 14). 64Loans based on an interest were only one of the major aspects of that kind of funds. Another aspect was charity work. Thus, whenever the deceased benefactor had explicitly requested in his/her will to devote part of his/her succession to charitable works (khayr, birr, iḥsān), such a request, upon the majlis’ approval, ought to be respected. What the ninth article did suggest though was that such acts of beneficience could be extended to other charitable institutions not included in the original wills: “any surplus [fāḍil] that remains after spending on specific works of charity [identified in a benefactor’s will] would go back to the orphans’ treasury and spent on building mosques whose waqfs’ [revenues] are meager, and on schools, offices, bridges, etc., as well.” So, the logic here was in parallel to that of loans with an interest: transcend the private nature of the fund and push it towards something more ambitiously public, in the sense of using that money for something other than the narrow interests of the beneficiaries; and only the guardians of those beneficiaries were consulted—never the beneficiaries directly. However, as with persons and their individual loans, not every public institution was eligible either for charity or loans: thus, treasuries known as ṣanādīq al-manāfi‘ al-‘umūmiyya were illegible for such loans (article 14). 66A parallel could certainly be drawn between that kind of text and the legal fiction of the death of the kharāj payer (as detailed in one of Ibn Nujaym’s “letters”). In both, the death of a person, owner of properties, entailed a de facto state “ownership”; either that person died with no heir, or else his/her will included “immature” beneficiaries (or at least perceived as such); and, in both cases, the state felt free to intervene and impose regulations on its own. In practice, that implied a full or partial seizure of private properties: in one, an irreversible confiscation, and in the other, an open confiscation, subject to negotiation. But considering that the death of the kharāj payer was only a legal fiction, that is to say, a juridical technique rationalizing why certain things are the way there are and the legal implications for that state of things—in this case, the massive state ownership of agrarian lands—the alleged “incompetence” of beneficiaries would also be perceived as a fiction of the same order: namely, one of those legal devices that helped in legitimizing the total or partial control of few private properties by the state. Indeed, one is struck by the total absence of preventive measures that would have allowed the beneficiaries (or their guardians) to protest were they not satisfied of the terms of the agreement. But not a single article was devoted to the issue; and, challenging the state and its institutions in court was no easy matter, if not inconceivable. 67Even though the orphans fund firman, the latest among those examined in this chapter, goes back to 1866, it strikingly hearkens back to archaic notions of contract and property. To begin with, Ḥanafīs look upon inheritance contractually: the inheritor receives from his benefactor a full contract that links him (or her) to the inherited properties in a way that is to be identical to the one that the benefactor had maintained for himself. The inheritor is thus contractually protected vis-à-vis the inherited properties, which in principle should become his own inalienable properties. In the case of minor orphans, their relationship to their appointed guardian is also contractual—in a way similar to the contractual relationship between representatives and their clients—so that a guardian that mishandles the orphan’s portfolio is liable for damages (as a seller is liable for a damaged commodity). Moreover, the appointment of guardians is usually the responsibility of the benefactors and the naming of a particular candidate must be indicated in the will. As we have already seen in one of the Shihābī cases (C 5-2), Ḥanafī courts accepted the same principle of representation, contractual relationship, and liability for non-Muslims too: Bashīr II had been named by his brother as guardian to his nephew’s properties, and one of the emir’s first actions upon his brother’s death was to sell the little boy’s properties and buy them for himself in order to compensate for the debt that his late brother had left behind. Since the contractual relationship is between guardian and orphan, the orphan will only be able to sue his guardian and charge him in mishandling his inheritance only when he completes the age of maturity. The handling of an inheritance should thus follow the general Ḥanafī principles in terms of an efficient management, meaning that the properties should not only remain as beneficial as they were but even more so if possible. 68One has therefore to assume that all those “orphans” (meaning all four categories) had already their appointed guardians in legally binding contracts, and that it was indeed one of those privileges enjoyed by benefactors to appoint guardians they trusted. The 1866 firman thus breaks with the all too commonly accepted practices at several levels: first, by not accepting the guardians that might have been appointed by the benefactors, and requiring instead that a special majlis handles the appointment of all guardians (article 4); and second, and more importantly, the orphans and their guardians were not permitted to use their properties as they please, namely as privately owned and for their own purposes. Since their portfolios had been transformed into quasi-public funds for lending and circulating money, their properties are not “theirs” anymore—at least not until their status changed. On both counts, then, sultanic legislation breaches Ḥanafī practice and imposes its own normative rules that were alien to what the populations had been accustomed to. In the absence of detailed empirical information on the volume of such funds, one can only speculate that all kinds of “orphans” portfolios must have been large enough so as to prompt the state towards new measures. In effect, the situation of all such “orphans” might be compared to waqfs in general in the sense that they all became a means to protect private properties either from fragmentation through intestate inheritance or from confiscation by local or state authorities. Large chunks of properties were thus kept out of circulation for their better protection and safety, and the firman was probably no more than an attempt to break such a deadlock. 69The heart of the firman comes in conjunction with the earlier 1852 firman which probed a 12 percent interest rate for loans completed between private parties and legally sanctioned by the state on the basis of that newly established interest rate (C 10-2). The 1866 firman, which intended to establish a loan policy out of the orphans’ deposits, assumes the existence of specific interest rates but never identifies them as such. The later firman, however, was stringent in terms of sureties since it required something in return for every loan, either a land or a guarantor. In short, private properties and funds had been open for new contractual types with anonymous people, and it is the legal implications of such an action that is our concern here. To begin with, since the whole telos of the enterprise had as a declared purpose of lending money upon interest, upon which legislation was such an action based? Certainly not Ḥanafism which neither encourages such loans nor provides any clear legislation regarding interest rates and the like. One should therefore look at both the 1852 and 1866 firmans as examples at how sultanic (state) legislation steps in to form new contractual forms hitherto nonexistent—at least not explicitly as such. But it does so aggressively: not only by bypassing Ḥanafism altogether, but also by opening up blocked properties to its new contracts. We therefore encounter that desire to provide new contractual forms that would accept types of transactions that the socio-economic realities have made more urgent. That was too the purpose of many of the fictitious litigations that filled the sharī‘a courts: they basically signaled the passing of properties from their family-based ownership to one in which the property would be the sole possession of an individual. 70The purpose of this chapter has been to explore the relationship between Ḥanafī practice and sultanic (hence state) legislation, and what emerges for that “transitional” period of the Tanẓīmāt is the coexistence of several jurisdictions, or what Max Weber would have called “law communities,” the autonomous jurisdictions of which overlapped.66 In fact, even though Ḥanafism and sultanic ordinances had a lot in common, they nevertheless remained autonomous, if not in competition with one another. Sultanic legislation, being promulgated by the state and without ties to a long tradition, had the upper hand, and, whenever necessary, it imposed its own normative values on issues the fiqh stumbled upon and thus became inefficient. One such instance is that of lending money upon interest. On two occasions, the state had first to fix interest rates and then create additional lending facilities from private funds, both of which would have been unimaginable in sharī‘a law. But if the state had the upper hand and decided which laws ought to be the most effective—a policy that became even more aggressive in the 1860s and later—it is probably because it looked upon all those sub-systems as “special laws” that served the purpose of maintaining various “communities.” The time had come when those “special laws” had to give place to more broadly defined state laws that would bring all such “communities” together under one set of jurisdictions. But does that imply that the normative values proposed by state legislation would be the ones to predominate so as to eclipse all religiously based systems? In the case of the 1866 firman, the vested rights of the orphans, which were granted by sharī‘a law, have been jeopardized by the firman itself: what was a settled right of absolute ownership has been transformed into a quasi-public fund without the consent of the “orphans,” their relatives, or guardians, none of whom, had they wished to do so, could sue the state institution that was created out of their own private properties. Would therefore the newly created norms under state legislation be apprehended in lieu of the preexisting ones? The question is not limited to the firmans we have explored in this chapter, but to the entire policy of the reforms, and, indeed, to all the newly promulgated laws that those societies have witnessed since the breakup of the Ottoman Empire. In short, new laws and regulations do not necessarily imply a related set of internalized normative values, and the actualization of norms with no deep roots in society is the greatest challenge that legislators and bureaucrats face whenever structural changes have been attempted. 2 That applied to Beirut only. Damascus and Aleppo had separate registers for their sultanic orders (awāmir sulṭāniyya) even though the latter were not exclusive to new legislative acts and there must have been other regulations kept somewhere else. The only register accounting for the minutes of the Damascus majlis in 1844-5 does contain some newly drafted regulations of the early Tanẓīmāt era. 4 Kemal Karpat, “The Ottoman Demography in the Nineteenth Century: Sources, Concepts, Methods,” in J.-L. Bacqué-Grammont & Paul Dumont, eds, Économie et sociétés dans l’Empire ottoman (Fin du xviiie - Début du xxe siècle), Paris: cnrs, 1983, 207-218; Zouhair Ghazzal, L’économie politique de Damas durant le xixe siècle: Structures traditionnelles et capitalisme (Damascus: Institut Français de Damas, 1993), Chapter 2. 6 Hanna Batatu, Syria’s Peasantry, the Descendants of Its Lesser Rural Notables, and Their Politics (Princeton: Princeton University Press, 1999), 109 (based on the John Bowring commercial report). 7 The “reserve army” statement is neither associated with nor clarified by any subsequent notification. Was the “reserve army” a parallel group to the regular army and used under exceptional circumstances? 9 The idea here is that, after the forty-eight individuals have been selected by lot, those among them who turn out were pursuing religious knowledge had to be excused from military service. Others will come to replace them. 10 The meaning of bilā ḥilāf in this context is far from clear. The literal meaning of ḥāf is “confederation,” which does not mean much in this context; the other possibility is “association” because of the ḥ root, but this, in turn, leaves the meaning suspended. 11 No month is specified: the reference could either be to the month following the lot drawing, or the month following the document’s date. The first seems more probable. 12 Frank E. Vogel and Samuel L. Hayes III, Islamic Law and Finance (The Hague: Kluwer Law International, 1998), 7. 13 The text says “give money” (yu‘ṭū darāhim), thus insinuating, even though a‘ṭa could both mean to give and to lend, a notion of lending money. 14 ‘Umalahseems to be a colloquial word, used as a plural of ‘āmil, worker (pl. ‘ummāl). The other possibility is ‘umlah, currency, money; but this seems unlikely because of the “and” that connects farmers and laborers. 18 The five piasters per kīs were calculated on a monthly basis as a one percent interest rate, that is, twelve percent for the whole year. 21 On the notion of māl mutaqawwam and its implications for exchange, see Chapter 3 on contracts and obligations. 24 Abdul-Karim Rafeq, “The Syrian ‘ulamā’, Ottoman Law and Islamic Sharī‘a,” Turcica XXVI (1994): 9-32, claims that loans with interest were never as officially widespread in Greater Syria as in Anatolia where the rate of interest throughout the seventeenth century was as high as 20 percent and apparently legally protected by the sharī‘a courts (p. 13). By contrast, courts in Greater Syria covered loans with interest only in a concealed manner and through well known legal devices, and with an interest that often amounted to 25 percent by the mid-nineteenth century: “Despite these excessive, if concealed, interest rates, however, the Islamic courts in Syria did not compromise the sharī‘a by legally acknowledging interest in credit transactions. Ḥ were used by both creditors and debtors in private dealings which fell outside the jurisdiction of the courts” (p. 22). However, as one of our cases clearly shows (C 3-1), concealed loans-with-interest could still be the subject of court action—a redrafting of the contractual settlement—whenever there is failure to deliver. 26 That money could either have originated directly from cash, the selling of properties for cash, or else it was the outcome of recycled surpluses. 27 Again, one of those words with no root in official Arabic. The verb tamassaka means to cling to, or persist in. So, presumably, tamassuk-āt refers to the contractual receipts detailing the debt’s amount and the mode of payment. 35 The text says tarki-hi bi-maẓbaṭah. This last word seems a colloquialism from ḍṭ, seizure; adjustment, regulation. The meaning is yet uncertain. 36 ar-Rumallī,that is, bilād al-Rūm, territory of the Byzantines, name created by the Ottomans for the two provinces of Macedonia and Thrakê in the Balkan. 37 Should have been mustathnāt. The meaning, however, remains far from clear: Were both the land and sea customs excluded? And excluded from what? 38 As in the previous sentence, the use of the verb alqā is unclear. For one thing, not even its spelling is correct: it should be without the alef at the end; then, its use in the sense of discard or cast away is uncertain. But what else could it be? 40 Could not determine what this tax was: Was the word ā (or ā?) derived from amad, duration, period, or time? 46 Ta’dībhas two complementary meanings: as education and refinement, and also as discipline and chastisement. The text plays on both meanings while it intends to be threatening. 47 Ernst H. Kantorowicz, Mourir pour la patrie, translated by Laurent Mayali & Anton Schütz (Paris: Presses Universitaires de France, 1984), 51-52. 50 Beirut sharī‘a courts, unnumbered register and pages, 4 Jumāda II 1283 (October 14, 1866): bilingual text (Turkish and Arabic), printed at the press of the Syrian provinces (maṭba‘at Sūriyya). 51 Even though the text refers to this category of beneficiaries as ṣīr/ṣaghīrah, minors, the clear implication throughout was that those were orphaned minors. 52 No indication is given as to whether this government was central or local, that is, limited to the wilāya in question, even though it does seem from the overall tone that the latter possibility is more probable. 53 Interestingly, the text limits itself only to the inherited movables and immovables whose testators died after the firman’s date of promulgation. It leaves out all properties (if any) that all four categories of individuals might possess from outside that particular inheritance. 55 Samadar Lavie, in her work on a Bedouin tribe in the South-East of the Sinai desert, noticed that not only were some persons were labeled as “mad” or “insane,” but, more important, they became what she defines as an “allegorical character,” such as the madwoman, who by virtue of their “rejection” from the tribe, became the bearer of “truth”: in other words, she became the “collective consciousness” of a tribe in a period of rapid and harsh transition marked by excessive pressures from the Israeli market for cheap Arab labor, and thus ended up saying what others had feared and dreaded, see The Poetics of Military Occupation (Berkeley: The University of California Press, 1990). 56 The extensive use of ḥūma in this second Tanẓīmāt period reflects, compared to earlier periods, an effort to modernize and centralize the local bureaucracies, even though much of the work was still done as in the good old days: ḥūma should thus refer to the wālī and majālis of the cities. 57 The text wrongly uses būṣulah, compass, instead of būlīṣah, broadly meaning an “attestation” of a transaction of some kind that took place; more specifically, it could denote a policy (insurance policy) or a bill of lading. 59 That is to say, not transformed into māl, an object ready for exchange and legally protected as such, or the properties left in the possession of the orphans for their own private use. 60 Legally, īāb means offer and is part of the “offer and acceptance” contractual settlement: see Chapter 3 on contracts. 63 The text says: al-arāḍī wa-l-‘aqār wa-l-amlāk; all of them designating, in the final analysis, landed properties. 64 In order to fully implement the phenomenon of “the office as vocation,” a bureaucracy must be based on salaries rather than “benefits” that state employees and the like would accumulate from their work. In other words, an employee’s income must come from an independent source as salary and unrelated to the people he is serving. Thus, the treasury that was created out of the orphans’ properties functioned in a way similar to the iltizām system in that what represented a multazim’s or employee’s “benefits” or “salary” was cut from the fund itself—and often in percentages that were abusive—so that a clear differentiation between benefits and salary did not occur. 66 Max Weber, Economy and Society, translated by Guenther Roth & Claus Wittich, 2 vols. (Berkeley: University of California Press, 1978), 2:697. GHAZZAL, Zouhair. Chapter 10: Hanafi practice and sultanic ordinances: Which normative rules did finally prevail? 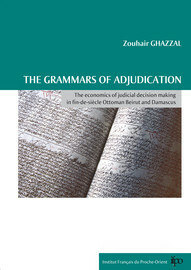 In : The grammars of adjudication : The economics of judicial decision making in fin-de-siècle Ottoman Beirut and Damascus [en ligne]. Beyrouth : Presses de l’Ifpo, 2007 (généré le 25 avril 2019). Disponible sur Internet : <http://books.openedition.org/ifpo/587>. ISBN : 9782351592694. DOI : 10.4000/books.ifpo.587. Ghazzal, Zouhair. “Chapter 10: Hanafi practice and sultanic ordinances: Which normative rules did finally prevail?”. The grammars of adjudication : The economics of judicial decision making in fin-de-siècle Ottoman Beirut and Damascus. By Ghazzal. Beyrouth : Presses de l’Ifpo, 2007. (pp. 573-611) Web. <http://books.openedition.org/ifpo/587>.